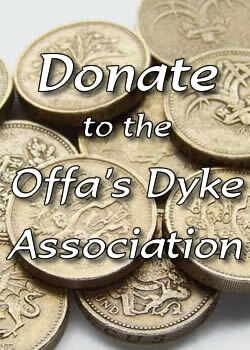 The executive committee of the Offa’s Dyke Association recently reviewed the delivery of our charitable aim. We are already a provider of interpretive and educational material here at the Offa’s Dyke Centre in Knighton but we have decided to branch out to help the landscape in a very practical way. We decided to direct our focus on the practical conservation and general well being of Offa’s Dyke, as well as any other archaeological monuments and areas of nature conservation interest along the line of Offa’s Dyke Path National Trail. Our interests now include Wat’s Dyke and the other short dykes of the Welsh March. We also run our own Conservation Fund which makes financial contributions towards the cost of maintenance or repair works as long as they bring long-term conservation benefits to the historic landscape. Anyone can apply to the Conservation Fund for help including farmers, landowners or local authorities, in fact anyone with a direct interest in managing the monument or National Trail can apply. The Fund is topped up each year from any surplus that make as a charity. Membership subscriptions and donations are ways that Trail walkers and visitors can make a very practical contribution towards ensuring the future well being of the Dyke and National Trail. If you are interested in finding out more about the Fund then please get in touch via oda@offasdyke.org.uk New members are always welcome! 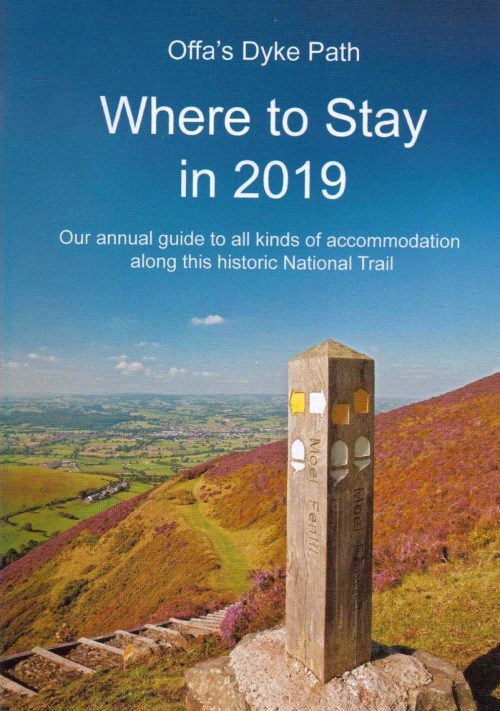 The following report of a conservation-based project on the path and monument in the Wye Valley was originally published in Newsletter 132 Summer 2017. We are very pleased to announce that our second Conservation Fund award, of £1,500 to Gloucestershire County Council, has helped to secure the permanent diversion of a section of Trail near to the Devil’s Pulpit in the Wye valley, from the crest of the monument to level ground alongside. 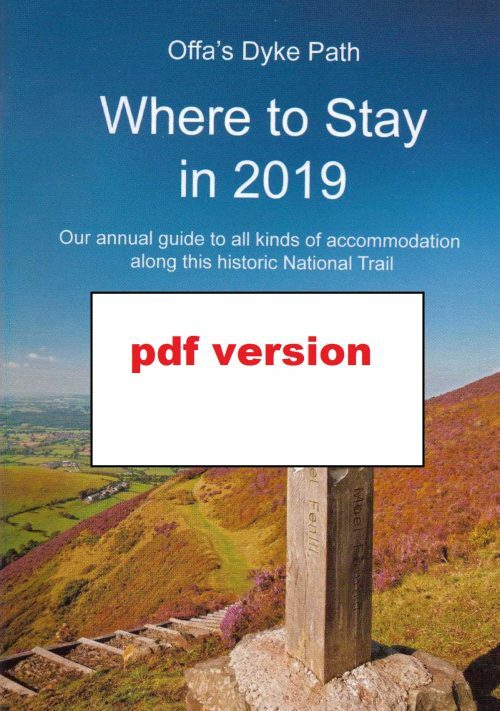 The following site report, by Jeff Wheeler, Public Rights of Way Inspector, Forest of Dean / West Gloucestershire; Amey, was originally published in the summer edition of our Newsletter. Offa’s Dyke: section approximately 700 metres south east of the Devils Pulpit. Historic England had already reported that they were very concerned about a section of the Offa’s Dyke Path through Worgan’s Wood near Tidenham Chase. For this section of path the Public Right Of Way (PROW) still ran directly along the top of the Dyke and the resultant damage was clear to see with thick mud almost making the route impassable. The next step (no pun intended) was to identify what work was required to move the line of the path into the adjacent woodland and then acquire quotes from our sub-contractors. The existing path on this section of Dyke was some two metres higher than the surrounding woodland, and so the challenge was to establish how we could link up the sections of path which came along either side of the Dyke. It was believed that the best solution was to create a wooden raised stairway over the Dyke and a raised boardwalk over the adjacent scheduled area to meet up with a new pathway some six metres away but parallel with the existing Offa’s Dyke Path. Where the new path crossed the Offa’s Dyke Path the surface would be protected by the use of a protective membrane and Type 1 aggregate to a depth of three inches and a width of two metres. This would prevent the erosion that was happening on this stretch of Offa’s Dyke. The use of a raised stairway and boardwalk would also mean that the application to obtain Scheduled Monument Consent from Historic England would stand a greater chance of being approved. The Gloucestershire Public Rights of Way (PROW) team were notified that an underspend by Natural England could mean that some funding was available to assist with this project as long as the project was completed by the end of the current Financial Year (31 March 2017). Funding would also be possible from the Offa’s Dyke Association Conservation Fund and Historic England if Gloucestershire PROW could match the sum being offered. This was agreed and quotes were obtained for the work from our sub-contractors. The first stage of the work involved the Forestry Commission clearing trees and scrub from the adjacent woodland which they owned and where the new path was planned to be placed. Luckily with the tight timescales involved at the end of the Financial Year it meant that this work could commence in January 2017 before approval was granted by Historic England and then the new pathway could also start to be constructed by the selected sub-contractor. In mid-February the area around the Dyke was CAT Scanned as part of the safety process before the contractor could make the small post holes in the surface which would support the wooden structures. By late February the Scheduled Monument Consent was finally granted which then left only four weeks for the sub-contractor to construct the stairway and boardwalk. Luckily the dry weather in March prevailed through the month and some sterling work meant that the boardwalk and stairway were completed before the end of the financial year. The diversion now seems to be working very well and all departments involved and walkers alike have praised the completed job which is a work of art. This section of path now connects two previously resurfaced areas of the Offa’s Dyke Path and with the superb views of the Wye Valley and Tintern Abbey from the Devils Pulpit is it one area worth walking if you have never been there before. The following site report of conservation based works at a site called Scotlands in Shropshire is by Andy Lipa, Area Rights of Way Officer, Shropshire County Council. It was originally published in Newsletter 131 spring 2017. The ODA made a contribution of £1,000 towards the cost of the project. There has been an age old problem with a natural spring part way down the hillside between Springhill and Lower Spoad near Scotlands. The spring runs across the National Trail and once fed a long gone pond on the other side. Trail Walkers have always had to skirt around or through the wet area at most times of the year, so the decision was made to improve the drainage and to slightly raise the level of the path. This would be achieved by installing a pipe as near the surface as practicable so as not to disturb the scheduled area of Offa’s Dyke, then applying a layer of locally sourced stone on top of it to try and overcome the problem. We first of all had to apply for Scheduled Monument Consent from Historic England which was granted in 2015, after which funding was then applied for. This was forthcoming from the ODA Conservation Projects Fund, Natural England and Shropshire Council budgets. A local Contractor was appointed and then over a two day period in the middle of August 2016 the job was carried out and now seems to be working really well. It might be worth incorporating the site into one of your walks sometime and see for yourselves.